Are you ever worried that you’re not doing enough in your homeschool? That is me all. the. time. I always feel the need to add more and more into our schedule. It might sound a little crazy, but I’ve found that adding additional resources to our curriculum can sometimes put my mind at ease. 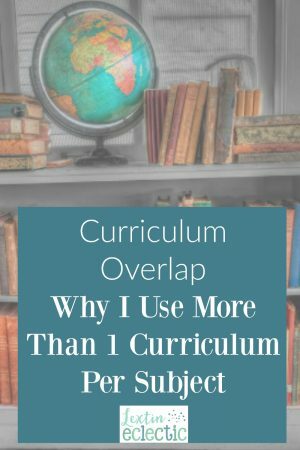 If you’ve glance through my curricula plans you’ve undoubtedly noticed that there are often numerous resources listed for each subject. As a matter of fact, I sometime use two different curricula for one subject. Other times I use bits and pieces of each to piece together our school year. If you’ve looked at curriculum it is apparent that different vendors market to students of different learning styles. I have a broad range of learning styles in my homeschool so I try to make sure that I teach to each style at various points in the year. When I use a blend of two different curricula I’m able to teach to multiple learning styles. For example: I use both Right Start Math and Math Mammoth. I’ve found that Right Start Math best teaches to auditory and kinesthetic learners while Math Mammoth addresses visual learners best. When I use them together my kids have a more well-rounded learning experience. As the teacher it can get boring to simply move through the progressive levels of a particular curriculum. Sometimes my kids are so familiar with the style of a curriculum that they start to guess at answers or they don’t pay attention well. When I add in an extra supplement from another publisher or use two different curricula for one subject, no one has a chance to be bored. I have to stay engaged in the lessons because I have to learn how the curriculum works. My kids get to learn a broader range of topics because of the overlap. For example: Nancy Larson Science is our main science program. We enjoy the teaching style and the variety of topics. However, I also add in Apologia elementary science. We read one book per year. It is a completely different style of teaching and it covers different topics at at different level of depth as the Nancy Larson Science. Because we use both we learn more about various topics and we enjoy the variety. I can never predict what topics will be a struggle for my kids to understand. Sometimes we find that we need greater review of a certain topic. When we use a blend of curricula then we are able to experience the same topic more than once so that my kids are always reviewing topics. For example: I use First Language Lessons as my main grammar resource. I teach spelling through the Phonics Road which also contains quite a bit of grammar. When we encounter the grammar in the Phonics Road it is often review (because we move through this curriculum more slowly) and it allows me to see how well my kids have retained certain topics that I taught earlier in the year. I don’t want my kids to do all of their studies through just one publisher and learn that author’s viewpoint without having the opportunity to explore other perspectives. When we use a variety of publishers and curricula we have the ability to explore bias, viewpoints, and perspectives. It allows me to help my children learn to question and think critically. For example: Story of the World is our main history curriculum for this year. I add in many additional resources to our studies in the form of outside books and encyclopedia articles. Through reading about the same events as recorded by different authors, we can see new angles and perspectives that we would have missed if we studied through the lens of only one individual’s perception. I have found that using a broad variety of curricula and supplements works best in our homeschool. That doesn’t mean that it’s not time consuming or a lot of work to plan ways to mesh the resources together. However, I’ve found that it’s worth it for me to spend the time researching curricula options that complement each other well. So, call me crazy but we have quite an interesting conglomeration of overlapping curricula in our homeschool! Are you wanting to plan your own eclectic homeschool? We also have our main curriculum and then add a variety of other textbooks, DVDs, etc. to round it out! I'm glad we're not the only "strange" ones! I've found that it works really well for us. I always have some type of spine or main book and then we add in other things. Sometimes I mesh two curricula together. It sounds crazy but it works really well!